We offer one of the most exciting educational activities in world: A chance for students to see wild and endangered animals in their natural environment. The fact that these animals are whales, some of the most iconic animals on the planet, makes it even better! As always, we also offer school groups a chance to learn about the whales (as well as other marine animals and the marine environment itself) directly from the most experienced naturalists in the area. Most of our naturalists have been studying the whales that frequent this area for more than 20 years! During the off-season, our naturalists have worked with whales and with other marine biology-related projects in Alaska, Hawaii, Florida, South America (Patagonia), Antarctica, Australia, and New Zealand. Beginning in 2014, 7 Seas is also proud to be partnering with one of the most prominent marine conservation organizations in the world: Ocean Alliance. Together with Ocean Alliance and the 7 Seas Whale Watch naturalist team, our passengers will have the opportunity to learn directly from the absolute best team of scientists, researchers, and educators anywhere in the whale watch industry. Our whale watch excursions consist of a 3-4 hour visit to the waters of Stellwagen Bank National marine Sanctuary or nearby waters (depending on exactly where the best whale sighting may be) to see the great whales that come to feed off of our coast each Spring through Fall. We normally venture between 12 and 20 miles from shore. Every trip is narrated by a professional marine biologist that has many years experience working with this very population of Humpback, Finback and other whale species, as well with public speaking and lecturing about whales to a diverse audience and in a variety of professional settings. We offer school groups that sail with us the newest, most comfortable, and safest whale watching vessel in the area. Our 108-foot vessel, the PRIVATEER IV, is known by many charter boat operators to be one of the classiest vessels along the eastern seaboard. The vessel is equipped with 2 modern, clean restrooms, cushioned indoor seating, a full galley and bar, and a heated inner cabin complete with a large-screen GPS display that allows passengers to monitor the ship’s speed, position, and heading at all times during their trip. Our captains and crew are highly experienced and are always friendly and helpful. We are located at Seven Seas Wharf, right alongside the famous Gloucester House Restaurant. For more than 50 years, the Gloucester House has been renowned for its lobster dishes and specializes in locally caught North Atlantic seafood. This is the perfect place for a dinner or lobster bake before or after your whale watch. 7 Seas Wharf is on the newly created “Maritime Trail.” Here visitors can watch fishing boats unload their catch, see lobster boats tending to their traps, or just take in the scenery from one of the most picturesque coves in Gloucester Harbor. We are also just one block from Gloucester’s main shopping district, the historic Fitz Hugh Lane House. We are a one stop destination. From Seven Seas Wharf you are just 1/2 block from Gloucester’s main shopping and dining district! 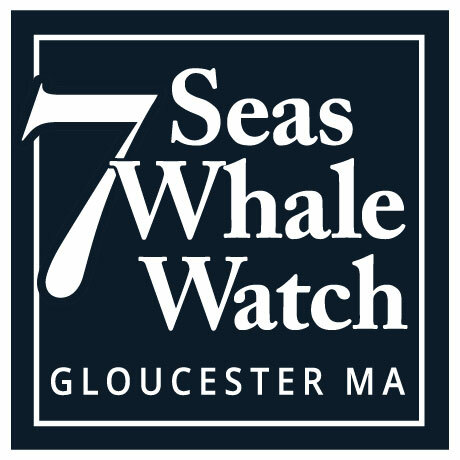 7 Seas Whale Watch is located on historic Seven Seas Wharf in the heart of downtown Gloucester, MA. Seven Seas Wharf is part of the Gloucester Maritime Trail, and one of the most picturesque areas of Gloucester’s inner harbor. We are about 45 minutes north of Boston and one-half hour north of Salem, MA. Motor coaches may park either on property or along the street immediately adjacent to the whale watch. Most importantly, Gloucester is located directly between two major whale feeding areas: Stellwagen bank and Jeffrey’s Ledge. Together these makeup “Stellwagen Bank National Marine Sanctuary.” Because of Gloucester’s unique location whale watching boats departing from Gloucester have an advantage over boats departing from any other port! We consider it a privilege to be able to share with you the whales and the abundance of other marine life that inhabits the waters of New England. We endeavor to provide you with the utmost in comfort and safety during your time on the water, to provide the best naturalists in the industry, the finest whale watch boat in the area, and of course to share with you the best possible whale sightings.By doing so we hope to promote a deeper understanding and appreciation of the whales and their fragile marine environment. We believe that doing all we can to support the research and conservation of these endangered animals is an essential responsibility of our business. Please contact our office for more information about booking a group tour!